India may suffer unnecessarily if and when American economy collapses. The downward spiral may have started with nasty stagflation. The stagnation in America comes from lack of pricing power, excessive borrowing, sky rocketing fiscal deficit, war expenses and Federal Reserve Bank’s mismanagement of fiscal affairs. How will that impact India? When you finish reading this article, you will feel bad. India had an underdeveloped but self-sustaining economy with very little borrowing from the ordinary citizens. Something went wrong in early 1990s. In the name of liberalization, India imported all the bad stuff from American economy. The freely available credit, ballooning budget deficit, trade deficit accompanied imported outsourced jobs. Americans are eager to use Indian brains but wants to pay only five cents for dollar worth of job. India’s local Governments opened the doors thinking several Bill Gates will make them rich over night. In the process India bought billions of dollars from these Americans and hardware is useless anyway by this time. Buildings and cities have been built with overcapacity looming everywhere. Young kids have been told to learn only computers because Americans are going to sell oil from Iraq, make a lot of money and bring truckload of jobs into India. If American economy is ok, there is no problem. Problem is that the American economy is tailing spinning into a major depression and that is going to drag India down to the mud. The overcapacity in India with young generation ready to work for TCSs, IBMs and Microsofts will never be used due to depression in US economy. US fiscal mismanagement actually started in mid eighties. Ronald Reagan did win the cold war but at the cost of sacrificing the best thing US had – Social Security. Things changed in Clinton days due to Internet boom and Year 2000 Computer scare which never really materialized. In the mean time, Bush Jr. came to power, 9/11 terrorism happened and US economy started moving downwards. At this stage, Bush and Federal Reserves Green Span converted America into a welfare country. When Air lines could not run their business, Bush gave them billions to survive and move on. Interest rates were lowered to almost zero. Cars were offered to public with no interest installment loans. People could buy homes with interest only loans. Income tax was reduced so that rich can spend more and pay less tax. Every American company today depends primarily on Government contracts to pay their bills. America went into Iraq so that American companies can make a lot of money from Iraqi oil money contracts. But nothing finally is working. Americans borrowed in billions from their home equities and now does not know how to pay them off. People are making less money, losing good jobs and taking low quality jobs with one third pay and no benefits. People are still ecstatic about America and the economy. These are signs of a major topping of an economy for a long run scenario. This depression may go on for as long as thirty years with dow reaching as low as 1000 or even less. India has positioned itself to shoot in the foot as American economy collapses. Two thins are going to happen. First, American companies will not have money to pay Indians. Secondly, America will change and outsourcing and free trade as we know it today will come to a halt. Inter country bartering system will eventually start that will eliminate all trade deficits and trade surpluses. America will enforce patent laws and India will have to follow the same. This will cause a lot of problem for those Indians dancing today thinking heaven is waiting for them in the planet of outsourcing. Favouring large-scale outsourcing of software services and R&D works to countries such as India, Steve Ballmer, chief executive officer of Microsoft said the US stands to benefit out of this. "We will have to increasingly bank on India for scaling up our operations to rise on the next wave of innovation. So, outsourcing is here to stay. I have always stated that the so-called outsourcing is good for the US economy," he said while delivering the Fifth Madhav Rao Scindia Memorial lecture on Wednesday. "With the US government making it more difficult for people to come into the US from outside, it puts pressure on companies like ours to relatively grow our talent pool in India even faster. About 18 per cent of our engineers in Seattle are Indians," he said. Ballmer, however, felt the attitude (against outsourcing) has improved over the last year. Based on a Global Delivery Centre model, the $23-billion Indian software services industry thrives on the offshore business. But this has led to a backlash in many countries, including the US, as a result of local job loss. Ballmer also stressed on Indian engineering talent to redefine the software industry. "Thirty per cent of all computer science graduates in the world are passing out of Indian universities. That puts a special responsibility on this country. The world is counting on the talent of this country to lead the next wave of innovation," he said, adding harnessing that talent, required companies to work with a big bold goal. The Redmond-based software giant also wants to ramp up its operations in India but said newly graduated IT engineers from Indian universities need more practical training. Ballmer said to ensure IT engineers are employable upon graduation 'requires a little bit of training' they don't receive while in school. Between 25 per cent and 30 per cent of engineers graduate from colleges and universities in India. Microsoft, Ballmer said, is working to boost engineer graduates' real-life experience through its training program at its New Delhi facility. The company said it hopes hands-on experience will help increase the number of readily employable and trained engineers worldwide. Microsoft`s research and development facility in India is the company's second largest R&D plant after its Redmond R&D centre. In 2006, Microsoft announced plans to invest $1.7 billion and increase the headcount to more than 7,000 in its Indian operations over the next several years. President A P J Abdul Kalam (R) talks to N R Narayana Murthy, chairman Infosys Technologies [Get Quote] as chief executive officer of Microsoft, Steve Ballmer, looks on during a Microsoft conference in New Delhi. 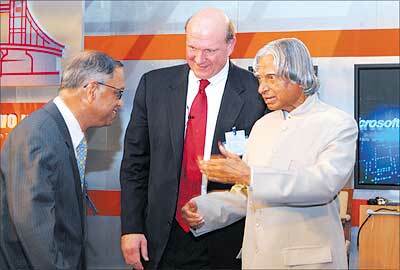 Microsoft hosted a conference titled 'Bridging the two Indias' which was inaugurated by Kalam.